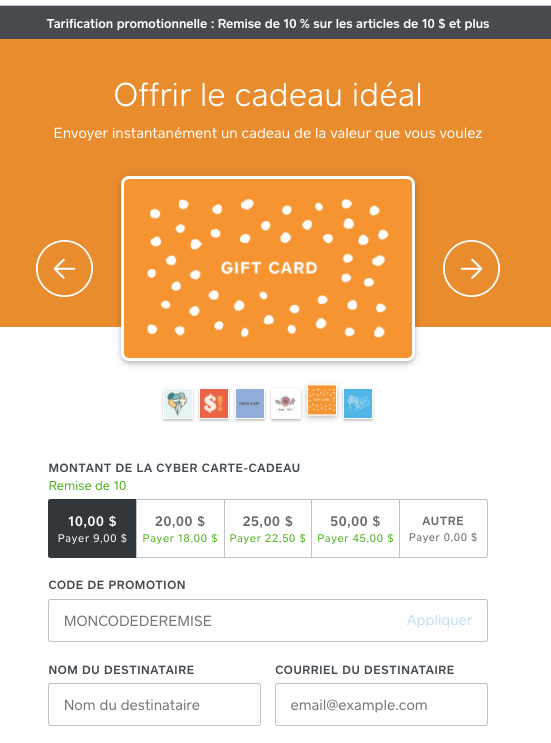 Create a promotion to encourage your customers to purchase eGift Cards at a discount. You can make this available to everyone who visits your eGift Card Order Page or make it available to customers with a promotion code. Note: You must finish setting up eGift Cards and publish your order site before you’re able to create a promotion. Promotion: This will create a dollar amount or percentage discount available to all visitors to your eGift Card Order Page. Promotion Code: This will create a time-based promotion only available to customers with the promo code. Note: Promo codes must be 4-20 characters long. Sign in to the Gift Cards section of your online Square Dashboard > eGift Cards. Select whether you’d like to offer a dollar amount or percentage discount. If you’re offering a percentage discount, you have the option to set a maximum discount amount. For dollar amount discounts, you have the option to set a minimum load amount. To discontinue a promotion, toggle the Enable button off. Enter a promo code that’s 4-20 characters long. Select an optional expiration date for this promotion. You can discontinue a promotion code at any time by clicking the three-dotted actions menu to the right of the code details and clicking End.